This page is dedicated to the mysterious world of raising and training a puppy! It is an exciting endeavor to raise a puppy. No matter what species, having a baby in the home can be a time of joy as well as feelings of inadequacy and worry. We believe strongly in giving puppies every opportunity to develop into dogs who will be an integral member of their human family. 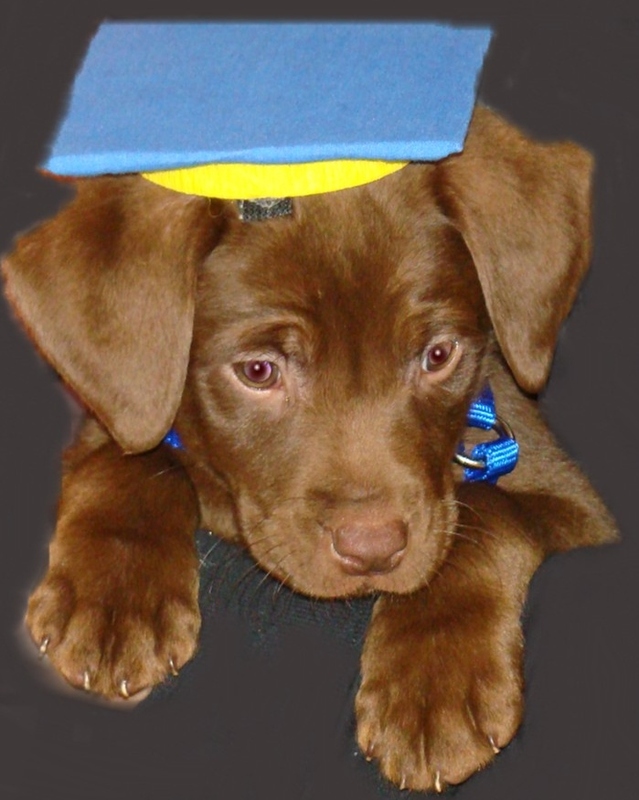 Our program is designed to enhance puppies’ future role as companions and work partners. In order for us to be on the proverbial “same page” there needs to be some discussion about the goals of training for puppies. They learn and grow at incredibly fast rates which means that we only have a small window of time to make our mark on their impression of the human world before becoming adult dogs. Without a positive view of human lifestyles and experiences, puppies can grow into adult dogs with a variety of issues that people find unacceptable such as growling at children, barking at guests, pulling while on leash, snarling at other dogs, and snapping at strangers who try to pet them. All these behaviors are not the result of poor obedience but more likely due to inadequate social experiences at very young ages. We can create some amount of change for older dogs with these issues, but more importantly we can avoid them from developing at all with relatively less effort if we start early. The CCH goal for training puppies is to take advantage of their natural ability to learn the skills necessary to become friendly and accepting of the many experiences they will encounter in their lifetime. The American Veterinary Society of Animal Behavior (AVSAB) believes that it should be the standard of care for puppies to receive socialization before they are fully vaccinated〈i〉 . This position is also supported by the UC Davis School of Veterinary Medicine〈ii〉 and the American Veterinary Medical Association〈iii〉 . According to AVSAB the fact is that behavioral issues—not infectious diseases—are the number one cause of death for dogs under 3 years of age. Keeping young puppies away from social experiences outside of the home prior to the completion of vaccinations only puts puppies at greater risk for developing chronic stress and behavior problems. Puppies have a specific window of time that their brain is primarily focused on social learning (interacting with others and the environment). This sensitive period of time occurs with the greatest impact before 4 months of age, and begins to provide less impact as the pup ages. Even if you do nothing at all, that period of time will impact puppy’s future in a permanent manner. For example, if a puppy is confined to the home during the early months of life, that is what becomes normal and comfortable to the puppy. Anything beyond those home experiences becomes a source of stress and potential for anti-social behaviors to develop. Just as the goal of puppy immunization is to reduce the risk of disease, early socialization reduces the risk of a puppy suffering from a lifetime of anxiety and behavior problems. CCH supports the prevailing recommendation by top veterinary experts to have puppies as young as 8 weeks of age participate in socialization training programs outside of the home in order to prevent the development of anti-social behaviors. Even if your puppy is older than 4 months of age, providing a rich learning experience as early as possible will have a better impact on learning. For older puppies, it is important that the experience does not overwhelm or frighten them. Puppies older than 4 months of age will react differently (than younger puppies) to unfamiliar social experiences. They need a learning program that will gently encourage their development of confidence while learning about new social experiences. It’s important not to immerse the inexperienced older puppy into too much stimulation all at once. Sudden exposure into public places or a highly active play group can have the opposite effect and create permanent fears. CCH Professional dog trainers work with older puppies to successfully introduce them into group learning and social interactions. One of the most influential types of learning that occurs with puppies is rehearsal, or repetitive practice. In other words, whatever your puppy practices over and over will become part of his adult habits. Does pup jump on guests every time they arrive? Or chew on your clothing every time you change your clothes? If it’s being rehearsed with consistent repetition it will become a lifelong habit. Other rehearsed behaviors such as pottying on the carpet, chewing the leash on walks, mouthing on hands, and jumping on the kitchen table will also not go away on its own. If those are behaviors you do not want in your future adult dog, then they should be prevented from being practiced and replaced with more acceptable behaviors that also satisfy puppy’s needs. Puppies don’t outgrow these types of rehearsed behaviors, but they do outgrow puppy stages. This means that pup will eventually outgrow the endless high energy, small uncontrolled bladder, and sore gums due to teething, but the behaviors that were practiced at that time will remain. The CCH program teaches families how to redirect, replace, and implement good behavior habits that will be more desirable for their future adult dog. Even if you are not sure or have no desire to pursue therapy dog or service dog training, you will improve your puppy’s potential two-fold if you start early and participate in a program that prepares puppy for the hustle and bustle of life in human society. What your puppy learns in an experiential program will improve your ability to include your future adult dog in family activities outside of the home. We can train any age dog for obedience but we only get one chance to take advantage of puppy’s natural abilities to become comfortable with a variety of people, and the places and things that people do. CCH specializes in preparing puppies using real-life situations and exposure into the community early in their training career when they have the highest potential for future success. Whether your puppy will have a more formal job or a job to be a great family member, the learning program needs to be well rounded and continuous to address puppies’ ongoing needs. Attending a six (6) week puppy obedience class does very little to adequately prepare puppies. The CCH School for Professional Canine Partners encourages the participation of all young puppies through open-enrollment using a pre-paid punch ticket. Our classes are designed to enhance the development of acceptable behavior in public while also addressing the needs of puppies to learn other skills during all aspects of their development. Puppies in our program participate in field trips, manners training, and all of the experiential classes with other partnerships. We find that their participation with more experienced partnerships adds value to their learning program. You are welcome to attend any class that fits your puppy’s training needs while using the same punch ticket. We encourage you to explore more information about the School for Professional Canine Partners and to get started as soon as possible by scheduling the private New Student Evaluation. How-to Not Mess Up Your Puppy! It’s just crazy how much there is to know about puppy raising and training. So much can go wrong during those early months that can impact your future life together. We have compiled a list of the top 5 things that people tell us about their puppy raising mistakes. Be sure to check out, How-to Not Mess Up Your Puppy!